The Head Ease Massage Blend is one of our most popular aromatherapy blends. Head Ease Essential Oil Blend diluted in Massage Base (ready to apply). Many of us experience tension in the neck and head areas when we're under stress, eating poorly or overly tired. This simple blend was designed to use when head and neck tension strikes. Definitely one of our our most popular! 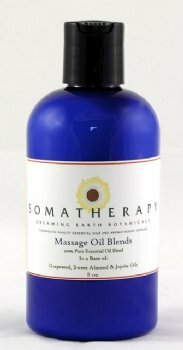 This essential oil blend is premixed in our massage base and can be used without further dilution. Rub lightly into temples and base of skull at the neck or add a cap full to a warm bath. A blend of 100% pure Essential Oils: Lavender and Peppermint in our Massage Base (a combination of Sweet Almond, Grapeseed and Jojoba oils).